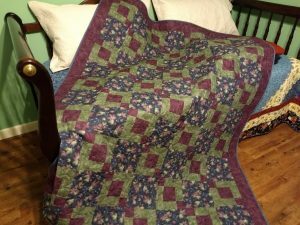 As I’ve mentioned in previous posts, quilters are a generous lot and we enjoy making and giving away quilts. My sisters, my mother, and I have been making quilts for a special facility that we hold dear to our hearts. It is a rehab home for women who have lost their way and it has been our pleasure to take quilts to them. They get to keep them if they complete the program. I just finished quilting and binding two more quilts for Charis House and will be taking them this summer. It was a thrill to pass out quilts to the ladies last year when we took our first batch of quilts. My 88-year-old mother pieced the quilt on the left and I did the one on the right. 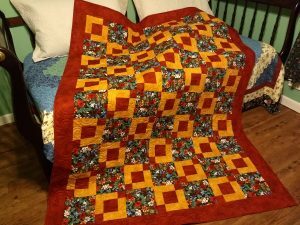 I’ll be going on a quilt retreat soon and hope to get a couple more pieced then.